Klezmer in a small line-up: festive and melancholic, but always exuberant repertoire, consisting of klezmer en related styles. Apart from concerts, the program is fit for parties and receptions and can be adapted to taste and situation. Usually, the performance is unamplified and therefore flexible in location. On large-scale occasions the line-up of clarinet/accordion can be extended with double bass, violin and a singer. For a first impression, you may listen to the fragments below. Some are especially for concerts, others more fit for parties and celebrations. Photos by Roman Vishniac, from "A Vanished World"
Oy tate (fragment), with Petervan Os on accordion, Tis Marang on double bass, Leon de Kroes on guitar. studied clarinet with Walter Boeykens and Hans Deinzer and specialized, besides working in classical music, klezmer and theatre, in contemporary music. Hij performed all over Europe, Russia, Ukraïn, India, China, the Middles-East, Mexico and the US and was a guest teacher at a.o. the Moscow and Paris Conservatories. 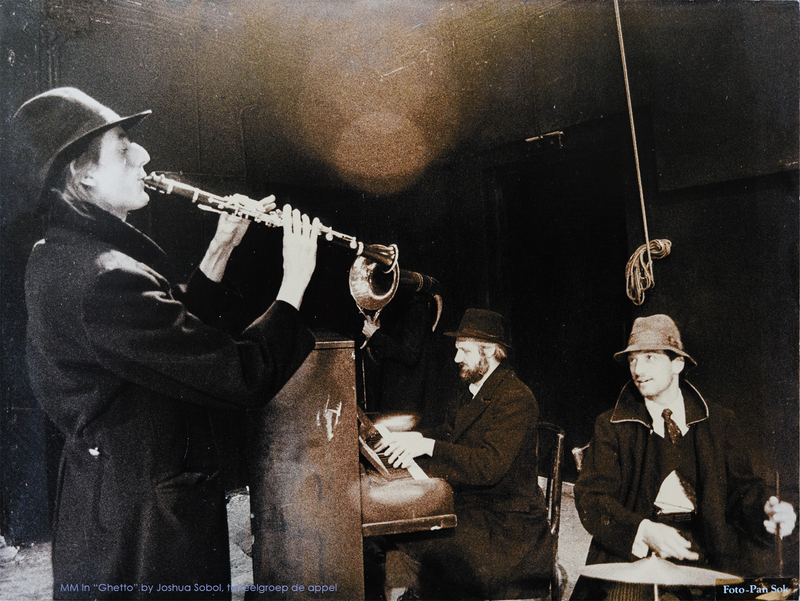 He played klezmer at festivals in Amsterdam, Berlin, Moscow, Odessa, New York and Philadelphia and plays in the bands Odessa Express en the Jewish Amsterdam Chamber Ensemble. studied accordion at the Hilversums Conservatorium, as well as piano and arrangment. Hij was active in new music and took part in numerous theatre productions, as a player and as a composer, a.o. with NNT, Het Filiaal , Nikitov, Jenny Arean en Frank Groothof. Also he is writing and playing music for film, video and TV and can be found on many CDs. He plays regularly in symphony orchestras and in several Balkan groups.